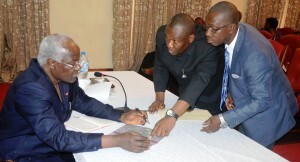 President Ernest Bai Koroma Monday 18 May mediated among officials of Fourah Bay College, Ministry of Lands, Country Planning and the Environment and leaders of the Fourah Bay College community over the disputed land impeding the implementation of the Arab Bank for Economic Development for Africa (BADEA) project. The area of encroachment is 21.4 acres. The government of Sierra Leone has secured over Thirty Million United States Dollars for the extension, rehabilitation as well as giving the institution a facelift to meet international standards. President Koroma pointed out that the BADEA Project is a priority in which anything standing in its way will not be negotiated and compromised with be it community owned or retired lecturers. He added that the GUMA Project is another key project tied to the needs of the community. Underscoring government’s commitment to giving the College a facelift, President Koroma stated that nothing should stand in the way of the project and efforts must be geared up to fast tracking the commencement of the project. “Nothing should stand in the way of the BADEA Project,” he emphasized. The President gave a two week timeline for all concerned to meet and find an amicable resolution to the situation and thereafter anybody standing in the way to the implementation of the project will face the full force of the law. He urged the College authorities to maintain the gardens around, secure the proper titles and give free hold property to Fourah Bay College. The president noted that the land impasse is a serious issue to all especially when it is connected to Fourah Bay College and the future of the country. Therefore, the need to protect the institution and making sure the structures, remain intact, is very crucial. He said government they will not sit down and see the situation deteriorating, adding that the future of students stands to be destroyed. “We are tired to see Fourah Bay College in its present state; that is why government secured over $30m to develop the institution and give it a facelift,” he stressed. The head of state reprimanded the Ministry of Lands, Country Planning and the Environment and community authorities for failure to settling the land dispute. He expressed dismay over the Ministry’s inability to stem the impasse. The Minister of Lands, Country Planning and the Environment Hon. Musa Tarawally said the land saga borders on two issues ranging from the university not having a permanent title on the property and the community requesting for public facilities to be built on the secured land. The Deputy Minister of Lands Ahmed Kanu said they had resurveyed the land as the ministry continues to engage the community to resolve the matter. Chairman of the Asset Committee of Fourah Bay College Mr Pascal Egbenda said they have made several complaints to the Ministry but stated that the ministry has not been able to do anything. He said for peaceful co-existence, the Ministry and the Parliamentary Committee on Lands agreed for sleeping dogs lie. The Chair of the Parliamentary Committee on Lands Hon Rosaline J. Smith said the committee has made several interventions to resolve the issue and informed the President that lecturers of the University also encroached part of the 21.4 acres.